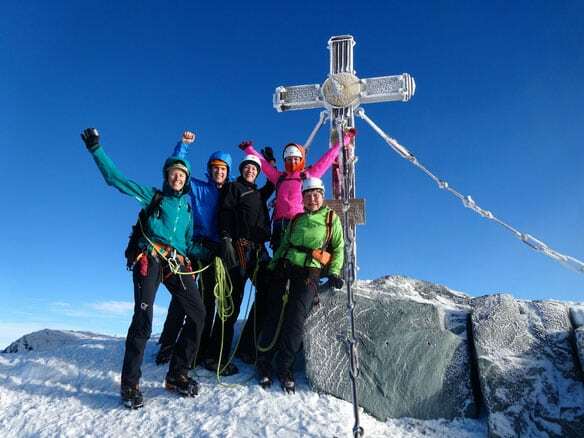 Maria, IFMGA certified guide, takes you to the top of the Grossglockner in this 2-day mountaineering trip in the Austrian Alps. The views are breathtaking! 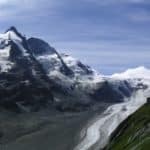 The Grossglockner (3789m) is the roof of Austria. And in fact, it’s one of the most famous peaks in the country. I invite you in this occasion to ascend it by the normal route in 2 days. It will be a demanding and rewarding ascent on the rock. In addition, the first day includes some fun via ferrata. And we will sleep at the Erzherzog-Johann-Hütte, the highest mountain hut in Austria. I can guarantee that you will never forget the panorama from the summit! You need to be prepared and in very food condition since we will ascend up to 400 meters per hour. 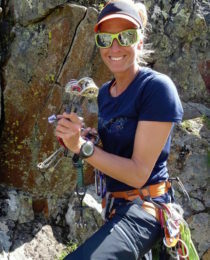 Besides, the difficulty of the climbing is up to UIAA 2. 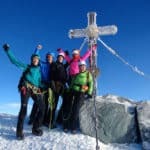 Interested in this 2-day ascent of Grossglockner? Then don’t hesitate to contact me! And you can also check out this ascent by the Stüdl ridge. Harness, helmet and crampons are included. I will take care of booking the accommodation. You are responsible for my expenses as well. We leave from the parking lot of Lucknerhaus (1918m). After ascending to Stüdlhütte (2802m) we take a short break. Then we continue along the Ködnitzkees to an easy via ferrata. leading us to the Erzherzog-Johann-Hütte (3451m), the highest hut in Austria. The sunset at this altitude is an unforgettable experience. Today we start early in the morning over the Glocknerleitl up to the rocks, which lead us to the Kleinglockner. The summit is already close, but before we finish the last passage in the rock, we head down again briefly to the Glocknerscharte. At the highest point of Austria, you can admire a unique panorama. During our descent, we will have a rest at the Erzherzog-Johann-Hütte before resuming the return. At the Lucknerhaus parcking lot.